I, along with many of you, am fighting hard to keep my head above the surface, as I tread the rising waters of the nascent Social Web. New sites are popping up every day. Join one, and you’re likely to go through a drill that’s become all too familiar: Generate another username/password pair. Recreate your profile. Slurp in your GMail or other address books. Build up your friends list all over again. In the process, generate a ton of connection request emails (also called “bac’n” — not quite spam, but not good for you). Robert Scoble highlights these problems in the upcoming May issue of Fast Company magazine in an article entitled, “How to Fix the Web.” Those of us working on the problem, appreciate the continued advocacy from Robert, who became a poster child for the issue of “data portability” in early January. Sharing the controversy with Robert, I did feel some intense heat from a very polarized debate at the time, but in hindsight, the pain was worth it. Within days, the DataPortability.org workgroup managed to sign up Google, Plaxo, and Facebook, in a move widely credited with setting the stage for 2008 to be the year of data portability. For those interested in helping move the ball forward, I encourage you to attend the Data Sharing Workshop in San Francisco in the next two days. It kicks off at 9:00 AM tomorrow. In my view, we are really on the cusp of the opening up of the true Social Web. Making it all possible is a collection of building block technologies (OpenID, Oauth, microformats, OpenSocial, the Social Graph API, and one or two still-missing pieces). But none of those technologies is anything a user needs to know about or understand. These enabling technologies need to get wrapped up into three or more critical services of the Social Web: Identity Providers (examples Clickpass and Yahoo! 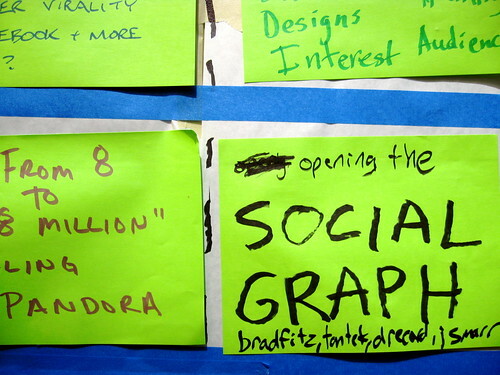 ), Social Graph Providers (stay tuned: Plaxo? Facebook? Others? ), and Content Aggregators (Plaxo Pulse, FriendFeed, Iminta, SocialThing, Facebook, and a new one every week!). Want more detail on this vision and how it snaps together? Be sure to see Joseph Smarr’s talk next Wednesday at the Web 2.0 Expo. Or see the great post by Kaliya (a.k.a “Identity Woman”), who is facilitating the unconference aspect of the Data Sharing Summit. There are a number of these various technologies being released to try and cope with this problem, but it seems all of them have places they do not go, and nothing quite fits yet. Facebook recently began aggregating data from other social services, but all that does is make another friendfeed – admittedly one where you probably have more contacts, but just an aggregator nevertheless – if data in any of the sites it aggregates is private, your friends won’t see it in the feed and will still need to create an account and add you before viewing it. In my opinion returning to the grass roots of blogs and hosted software is the way to go – giving us back full control of our friends list and portability to any App built on a compatible API. For those without domains and webspace, they could use their friends blogs, or larger services whose sole purposes would be to provide these services. Whilst there may be less opportunities for monetising that model, I think it better serves the individuals in the long run. Mike, I agree that the individual site approach would be the best for individuals, however, I think this ship has already sailed. For as easy as it is to update and maintain a WordPress or Blogger site (amongst the zillions of options), there are many for whom that’s too much work. I think that for the masses, sites like Facebook, et al, will be the de factor standard. Those of us with blogs and individual sites will probably always struggle to merge the two environs.